The etymology of the first syllable though, is not known. The most likely theory is that the first syllable was the Old English word - wād - which was the name of the plant now known as woad (a plant used to produce blue dye). If that theory is correct, the name probably derives from a location named by early Saxons where woad was found growing (or being cultivated) in a meadow. Other less likely theories are that "wad" might derive from the Saxon personal name "Wada", or that it may derive from the Old English word "wadan" (closely related to the modern verb "wade"). Regardless of the exact etymology, the name is probably toponymic (or location based) - meaning our ancestors probably came from a location in England that was called Wadley (or similar spelling) and were named after their hometown. If so, the location might have been the hamlet/manor of Wadley (near Oxford) in what is now Oxfordshire (but was previously part of Berkshire). Wadleigh and Wadley are interchangeable surnames that probably have the same origin. Wadleigh is the more archaic spelling (because it had retained the fricative consonants); likely indicating that those with the Wadleigh spelling probably came from rural areas in the south-west of England (where other similar archaic features have been retained in the local dialect). The suggestion that the Wadleighs come from south-west England is supported by general oral tradition (that the Wadleighs came from Herefordshire); written records (that our Wadleighs lived in Bristol before emigrating for America) as well as DNA evidence (see below). Our earliest known ancestor John Wadleigh was born circa 1600 in England. We have not been able to find evidence of his parentage or birthplace or really anything about him before he migrated across the Atlantic Ocean. The only known record which provides any information on him and his family while in England was the 1653 baptism of his granddaughter which indicated that John's daughter Mary was born at "Bristol near London" [probably Bristol in Gloucestershire]. If the Bristol theory holds true, one possibility for his identity is a John Wedley/Wadley (son of Richard and Ann), who was baptized in 1602 in the small village of Dymock, about thirty miles northeast of Bristol. The similarity in name, age and geographic location warrants further research. The Wadley family of Dymock can be traced back to the early 1500s. The postulation that the Wadleighs in America descend from the Wadleys of Dymock is nothing more than my own guesswork based on NO proof or evidence. Please use caution. In order to trace our Wadleigh ancestry before the first generation listed below, and to connect them to other Wadleigh and Wadley families, we may have to turn to DNA evidence. See below for more details. As of February 2010, we have the beginnings of a Wadleigh surname DNA project. Currently, we are in the Waddell DNA Project group through FamilyTreeDNA, until we can get enough Wadleighs/Wadleys included to have our own group. We only have four Wadleighs who have been tested so far, and we need more of you! We would like to invite any and all male Wadleighs or Wadleys to join the project and have their DNA tested. Results so far indicate that three of the four tested Wadleighs have a definite genetic relationship and the fourth in the group does not. None of the Wadleighs have any genetic relationship to the Waddells in the group. The DNA evidence shows that the three matching Wadleighs have a haplogroup that while uncommon in the UK, shows up most frequently in south-central and south-west England (which supports the theory listed above). The same haplogroup has a likely origin in the Balkan Peninsula (in the area of what is now Bosnia and Croatia). It is not known how or when our proposed paternal ancestor arrived in Britain - but one theory is that his migration may have been related to the Roman conquest and colonization of Britain. Note: the DNA project specifically tests Y-chromosomes, so only males can be tested, and they must be in the direct paternal line. In order for the test to have any use in proving relationship, you must order a 37-marker (or higher) test. Have your DNA tested today by joining the Waddell DNA Project (you get a discount for joining the group). Check out the Internet Movie Database to find an official listing of Wadleighs who have been involved in the movie business. This theater room is inside of Daggy Hall at Washington State University. It was named after Professor Paul C. Wadleigh who was head of WSU's drama department for decades. The 'USS Wadleigh' (Navy Destroyer ship during WWII) was named after George Henry Wadleigh, the 4th cousin of my great-great-great-grandfather, John Blake Wadleigh. 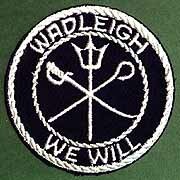 The logo on the patches that the navymen wore was embroidered with the motto "Wadleigh We Will." The ship was in service in the US Navy from 1943-1962. It was afterwards sold to the Chilean Navy where it was renamed "Blanco Encalada." It has since been scrapped. The original Wadleigh pear tree was planted by Joseph Wadleigh (1759-1851) in Sanbornton, New Hampshire on the farm that he settled in 1782. By 1882, the original tree had disappeared but there were descendants growing throughout the town and 'Wadleigh' had become an acknowledged variety of pear in the area. Wadleigh pear trees can still be found to this day growing in Sanbornton and the vicinity. Apparently, they are characterized by their distinct flavor and their early ripening. John Wadleigh was born circa 1600 in England 1,37. He died before September 16 1,37 or September 20 2,3, 1671 in Wells, York Co., Maine. John was born in England in about 1600, but any details on his life in England are not known. According to one source, his daughter Mary was born at "Bristol near London." Bristol is not near London though, and was actually in Gloucestershire in western England. In the early 1630s, John and his family left England made the trip over the Atlantic Ocean for the English colonies of America. John is first found in American records in 1636 when he was living in Saco, Maine 2,3,33,37. Some have suggested that the Wadleighs may have been among the colonists brought to Saco from England by Richard Vines. If so, they may have been among the original settlers who came in 1630. John was still in Saco in 1639, when he was deeded land [probably in what is now Kittery, Maine]. Sometime between 1639 and 1645, he had settled with his family in Wells, Maine; where they remained. By occupation John was a planter 33,37 and was also said to be a ship carpenter 37 and a vintner (wine maker) (source unknown). He was also an innkeeper in Wells. John also served on grand juries, and was an arbitrator, selectman and commissioner. In 1649, John purchased land from the local Indians containing most of the town site of Wells. The condition of the deed was that John was required to deliver one bushel of corn per year to the chief's mother, Romanascho. John wrote his will on July 7, 1671 in which he directed to be buried next to his wife; named three children; and left oxen named Sparke and Berry to his daughter Mary. He died before September 20, 1671, when the inventory was made of his estate. John was married to Mary in about 1625 in England. She was born circa 1600 in England 1 and died between 1664 and 1671 in Wells, York Co., Maine. Some have suggested that her name may have been Mary Goddard (source unknown). The only contemporary source I know of which names her is a deed in 1663 when she and John transferred land in Wells, and she was described as his wife. It is entirely possible that she was a later wife and not necessarily the mother of his children. She died sometime between April 18, 1664 (when she acknowledged the deed executed in 1663) and July 7, 1671 (when she was described as deceased in John's will). 2 Mary Wadleigh was born circa 1629 in Bristol, Gloucestershire, England 1. She married Thomas Mills. 3 Joanna Wadleigh was born circa 1632 in England or Maine 1. She married first to Jonathan Thing. (He was born circa 1621 in England 1 and died on April 26, 1674 in Exeter, Rockingham Co., New Hamsphire 1. She married second to Bartholomew Tipping. 4 John Wadleigh was born circa 1636 in Wells, York Co., Maine. He married Margaret. There is no proof that this John Wadleigh was the son of John and Mary Wadleigh. It is based on circumstantial evidence that other researchers have proposed a son named John (who married Margaret). When John Wadleigh (above) wrote his will in 1671, there was no mention of a son named John. Also, subsequent DNA evidence has shown that a known descendant of this John Wadleigh (husband of Margaret) has no genetic relationship to known descendants of Robert Wadleigh (son of John and Mary). Also, if immigrant John Wadleigh had a son named John, it is likely that he would have been listed as "Sr" in at least some records, but he was not. Robert Wadleigh was born circa 1628 in England 2. He died circa 1708-1709 in Exeter, Rockingham Co., New Hampshire 1. Robert's birth place is unknown - but since there is record that his sister Mary was born in Bristol, England - he may have also been born there. Robert was a young child when he moved with his family to America, and settled with them in Saco, Maine. He moved with them once more to Wells, Maine. In about 1654, Robert moved to Kittery, Maine. In Kittery, he kept an inn (tavern) and also operated a ferry over the Piscataqua River. Sometime between 1662 and 1666, he moved with his family to what was then the town of Dover, New Hampshire. There, they apparently lived at Oyster River [now the town of Durham], but also apparently lived in what is now the town of Lee. Sometime before 1668, Robert had erected a sawmill at the falls of the Lamprey River and was granted a license to operate the mill in 1669. [Because of this, the falls of the Lamprey River are to this day still known as Wadleigh Falls.] In about 1676, Robert moved with his family to Exeter, New Hampshire, where he remained until his death. Robert was an active citizen, often serving in public office. He was at various times a selectman, commissioner, clerk, constable, delegate, councilor, captain, justice of the peace and judge. Robert was a large landowner and in 1683 he paid the highest tax in the town of Exeter. In 1683, Robert traveled to England to petition the Privy Council of the King to settle a land dispute. It is said that his trip may have also included his petitioning for the pardoning of his three sons - John, Joseph and Robert - who had participated in Gove's Rebellion of 1683. Robert had returned to New Hampshire by May 1684. Robert was married to Sarah in about 1654, probably in Wells, York Co., Maine. She was born circa 1632 and died after 1698 in Exeter, Rockingham Co., New Hampshire 1. * Sarah's origin is unknown. Although no known contemporary source provides her maiden name, many researchers have accepted that her maiden name was Smith (I do not know the source or reasoning behind that name). 1 Sarah Wadleigh was born on June 15, 1655 1 probably in Kittery, York Co., Maine. She married John Young on February 1671/2 in Exeter, Rockingham Co., New Hampshire 1. She married second (or first?) to a Mr. Robinson. 2 John Wadleigh was born on December 7, 1657 1 probably in Kittery, York Co., Maine. He died on November 7, 1727 1. He was married to Abigail Marston in 1683 in Exeter, Rockingham Co., New Hampshire. 3 Robert Wadleigh was born on December 26, 1659 1 probably in Kittery, York Co., Maine. He died in 1734 in Exeter, Rockingham Co., New Hampshire. He married Sarah Nelson on September 8, 1696 1. 4 Joseph Wadleigh was born on December 3, 1660 in 1 probably in Kittery, York Co., Maine. He died in 1683 or 1684 1. 5 Mary Wadleigh was born circa 1664 1 probably in Kittery, Maine or Dover, New Hampshire. She died on December 24, 1727 in Hampton Falls, Rockingham Co., New Hampshire 1. She married John Cram in March 1689/90 in Exeter, Rockingham Co., New Hampshire 1. (He was born on April 6, 1665 in Hampton Falls, Rockingham Co., New Hampshire 1 and died in January 1727/8 in Hampton Falls, Rockingham Co., New Hampshire 1. 7 Jonathan Wadleigh was born circa 1666-1670 1 probably in Dover, Strafford Co., New Hampshire. He died in 1755 or 1756 in Exeter, Rockingham Co., New Hampshire 1. He married first to Ann Wilson and second to Abigail Eastman. Henry Wadleigh was born on May 16, 1666 1. He died on August 2, 1732 in Exeter, Rockingham Co., New Hampshire 1. Henry's birth place is unknown - he was probably born in either Kittery, Maine or nearby Dover, New Hampshire. When he was young, he moved with his family to the falls of the Lamprey River [now Wadleigh Falls], in what is now Lee, New Hampshire. By 1676, they had moved permanently to Exeter, New Hampshire. Henry spent the remainder of his life in Exeter, New Hampshire. There, he worked as a millwright. He also jointly owned a mill in Kensington, which was operated by his son Joseph. He was a selectman in 1695 and also served on the grand jury. Since Henry was sometimes known by the title "Ensign", he probably had some military service. Henry was married to Elizabeth Gilman, the widow of Nathaniel Ladd, on December 3, 1693 in Exeter, Rockingham Co., New Hampshire 1,2,3. She was born on August 16, 1661 in Exeter, Rockingham Co., New Hampshire 1,2,3. She died in 1733 or 1734 in Exeter, Rockingham Co., New Hampshire 1. 1 Sarah Wadleigh was born on September 3, 1694 in Exeter, Rockingham Co., New Hampshire 2. She died after 1725. She married John Scribner in 1713 in Exeter, Rockingham Co., New Hampshire. 2 Abigail Wadleigh was born on September 2, 1696 in Exeter, Rockingham Co., New Hampshire 2. She died after 1756. She married Samuel Maggon. 4 Martha Wadleigh was born in January 1700/1 in Exeter, Rockingham Co., New Hampshire 2. She married Ephraim Philbrick in 1722 in Exeter, Rockingham Co., New Hampshire. 5 Benjamin Wadleigh was born in 1703 in Exeter, Rockingham Co., New Hampshire 2. He died in 1716 in Exeter, Rockingham Co., New Hampshire 2. Joseph Wadleigh was born in September 1698 in Exeter, New Hampshire 1,2. He died on April 14, 1779 in Kensington, Rockingham Co., New Hampshire 1,36. He is buried in the Kensington Cemetery, Kensington, Rockingham Co., New Hampshire. He was probably named after his uncle Joseph Wadleigh who died in the 1680s in prison after taking part in the Gove Rebellion. By occupation, Joseph was a carpenter and joyner [joiner]. He has also been described as a "noted mover of buildings" 5. As a youth, Joseph moved to the town of Kingston, New Hampshire; where he operated a sawmill for his father, who lived in Exeter. Joseph probably moved to Kingston in 1719, when his father deeded him one quarter of the sawmill there and rights to the land belonging to it. At that time, he was also deeded 11 acres of land in Exeter. Later, in 1727, Joseph bought out the remainder of his father's sawmill rights in Kingston. In 1734, Joseph served as executor of his father's estate, who had died in 1732. He also inherited the house in Exeter where his mother lived, which had been given to her by her father John Gilman. Although Joseph owned property in Exeter, he apparently never lived there again. Although Joseph may have operated his father's mill in Kingston, he probably did not live there. Joseph lived farther east in the part of the town of Hampton that became Kensington in 1737. Joseph was a resident of Hampton (now Kensington) in 1727. Later, when Kensington was incorporated in 1737, Joseph was on a committee to call the first town meeting. Although Joseph and his family lived in Kensington, they apparently attended church in the neighboring town of Hampton Falls (Joseph was married there in 1725 and four of his children were baptized there between 1728 and 1734). Joseph married his first wife, Lydia Smith, probably soon after moving to Kingston or Kensington. Sadly, she died after only a few years of marriage. Joseph married second to Mary Fogg. They remained married for 49 years until her death in 1774. He married his third wife, Esther Fogg Dearborn, a relative of his second wife. She survived him. Joseph remained in Kensington until his death. Based on his land dealings and the terms of his will, he was apparently relatively financially successful. He died from consumption [tuberculosis] 36. He married first to Lydia Smith in about 1720 in Kensington, Rockingham Co., New Hampshire 1. She was born circa 1699 in New Hampshire and died in 1723 or 1724 in Kensington, Rockingham Co., New Hampshire 1. 1 Theophilus Wadleigh was born on July 30, 1721 in Kensington, Rockingham Co., New Hampshire 1. He married first to Abigail Bean on June 13, 1742 in Kensington, Rockingham Co., New Hampshire 1. He married second to Catherine Folsom in about 1766 in Exeter, Rockingham Co., New Hampshire. 2 Joseph Wadleigh was born in September 1722 in Kensington, Rockingham Co., New Hampshire 1. He died on December 31, 1808 1,44 in Kensington, Rockingham Co., New Hampshire. He is buried in the Upper Yard Burial Ground, Kensington, Rockingham Co., New Hampshire. He married first to Anne Dearborn on January 11, 1748/9 in Kensington, Rockingham Co., New Hampshire 1,4. She is buried in the Upper Yard Burial Ground, Kensington, Rockingham Co., New Hampshire. He married second to Jane Buffam on December 14, 1786 1. 3 Lydia Wadleigh was born in 1723 or 1724 in Kensington, Rockingham Co., New Hampshire 1. She died after 1765. She married Nathaniel Robinson circa 1749. Lydia was named in her maternal grandfather's will, dated March 14, 1736/7. She was left 20 pounds by her grandfather, to be paid when she reached the age of 21 or was married. Lydia was also named in her father's will of 1765, in which she was left 50 pounds and one his silver spoons. Lydia and her husband apparently settled in Epping, New Hampshire; where most of their children were probably born. Lydia's family apparently moved to rural Meredith, New Hampshire in the 1770s. Since we do not know when she died, it is not clear if she died in Epping, or if she moved with them to Meredith. 1 Benjamin Wadleigh was born circa February 1727/8 in Kensington, Rockingham Co., New Hampshire. He was baptized on February 18, 1727/8 in Hampton Falls, Rockingham Co., New Hampshire 42. He died after 1783. He was married to Hannah Dearborn on October 29, 1752 1. 3 John Wadleigh was born circa November 1732 in Kensington, Rockingham Co., New Hampshire. He was baptized on November 26, 1732 in Hampton Falls, Rockingham Co., New Hampshire 42. He died on August 30, 1762 1. 4 Mary Wadleigh was born circa December 1734 in Kensington, Rockingham Co., New Hampshire. She was baptized on December 22, 1734 in Hampton Falls, Rockingham Co., New Hampshire 42. She died before May 20, 1761 in Epping, Rockingham Co., New Hampshire. She married Enoch Coffin on December 26, 1757 in Epping, Rockingham Co., New Hampshire 1. 5 Sarah Wadleigh was born circa 1738 in Kensington, Rockingham Co., New Hampshire. Many researchers indicate that Joseph and Mary Wadleigh had a daughter named Sarah, but I am not aware of the source. She was not named in her father's 1765 will. There is no record that she was baptized with her siblings in Hampton Falls, and no record that she was married in any of the towns in the area. If she did exist, she probably died young. Joseph married third to Esther Fogg, widow of Henry Dearborn, on January 17, 1775 in Kensington, Rockingham Co., New Hampshire. She was born on March 16, 1696/7 1. She died on July 4, 1801. She is buried in the Kensington Cemetery, Kensington, Rockingham Co., New Hampshire. James Wadleigh was born circa August-September 1730 in Kensington, Rockingham Co., New Hampshire. He was baptized on September 20, 1730 in Hampton Falls, Rockingham Co., New Hampshire 42. He died after 1776. He was probably named after his maternal grandfather, James Fogg. James was born and raised in Kensington, New Hampshire, but his family apparently attended church in nearby Hampton Falls, New Hampshire. He was married to Mary Dearborn in Hampton Falls in 1752 (James' half-brother Joseph Wadleigh was married to Mary's older sister Anne Dearborn). At the time of the marriage, James was listed as a resident of Kensington. They immediately settled in the town of Epping, New Hampshire, where they raised a large family. James was a carpenter and millwright (like his father, grandfather and great-grandfather before him). According to one source, James built the first mill at Franklin Falls, New Hampshire (which was erected by his brother-in-law Jeremiah Sanborn) 5. When his father wrote his will in 1765, James was left 20 acres in Epping adjoining another 20 or 30 acres that he had already given him. He was also left one of his father's silver spoons. James is last found in the year 1776 on a tax list for the town of Epping. We have not been able to find any information on him after this date. Although he may have remained in Epping, it is also possible that he moved to central New Hampshire (Sanbornton or Meredith), where most of his sons had settled. One source indirectly implies that James lived on the farm in Sanbornton owned by his son Joseph 5, who had settled there in about 1782. If that's true, he may have been buried in an unmarked grave in the "Old Wadleigh Farm" Cemetery there. Although James and Mary are said to have had the below ten sons, I do not know if there are any sources that directly prove this. It is possible that the below children may have been born to different mothers. In the 1881 History of Sanbornton, New Hampshire, the following excerpt is about James: "two of his sons [James Jr and Joseph] settled in this town, viz ... Three other sons, brothers of the last names (one a half-brother) settled in Meredith, and a sixth remained in Epping." There were actually four brothers that settled in Meredith (John, Nathaniel, Simeon and Josiah). If one of these really was a half-brother, then it probably was the youngest son, Josiah who was apparently born in 1771. If so, Mary Dearborn may have died during the late 1760s or early 1770s and James remarried to an unknown second wife. James was married to Mary Dearborn on November 16, 1752 in Hampton Falls, Rockingham Co., New Hampshire 1,43. She was born on August 1, 1732 in Hampton, Rockingham Co., New Hampshire 1,4. She died at an unknown date. 3 Nathaniel Wadleigh was born in 1758 in Epping, Rockingham Co., New Hampshire. He died in 1834 in Meredith, Belknap Co., New Hampshire. He was married to Mary Robinson. 4 Joseph Wadleigh was born before January 21, 1759 in Epping, Rockingham Co., New Hampshire 5. He died on July 10, 1851 in Sanbornton, Belknap Co. New Hampshire 5. He was married to Molly Weeks on May 3, 1787 in Sanbornton, Strafford (now Belknap) Co., New Hampshire. He married second to Mrs. Sanborn after 1823. 5 Dearborn Wadleigh was born in 1761 in Epping, Rockingham Co., New Hampshire 1. He died after 1830, probably in Deerfield, Rockingham Co., New Hampshire. He was married to Judith Roby/Robey/Robie in March 1793 1 or on March 7, 1793 in Deerfield, Rockingham Co., New Hampshire 34. Dearborn was listed as a resident of Epping when he married in Deerfield in 1793. He and his wife were last found living in Deerfield in 1830, and probably died there before 1840. 6 Simeon Wadleigh was born on October 3, 1762 in Epping, Rockingham Co., New Hampshire. He died on August 25, 1843 in Meredith, Belknap Co., New Hampshire. He is buried in the Wadleigh Cemetery, Meredith, Belknap Co., New Hampshire. He was married to Abigail Hayes on October 27, 1785 in Sanbornton, Strafford (now Belknap) Co., New Hampshire. She is buried in the Wadleigh Cemetery, Meredith, Belknap Co., New Hampshire. 7 Thomas Wadleigh was born in 1763 in Epping, Rockingham Co., New Hampshire 1. He may have died in Hillsborough Co., New Hampshire. 8 Enoch Wadleigh was born in 1766 in Epping, Rockingham Co., New Hampshire 1. He died on June 6, 1838 in Epping, Rockingham Co., New Hampshire 1. He was married to Hannah Morrill on August 6, 1782 1. 9 William Wadleigh was born in 1771 in Epping, Rockingham Co., New Hampshire. He may have died in Kensington, Rockingham Co., New Hampshire. He was married to Mary. 10 Josiah Wadleigh was born in 1771 in Epping, Rockingham Co., New Hampshire 1 and died in 1822 in Meredith, Belknap Co., New Hampshire 1. He is buried in the Chapman Cemetery, Meredith, Belknap Co., New Hampshire. He was married to Sally Chapman. James Wadleigh was born on August 10, 1753 in Epping, Rockingham Co., New Hampshire 1,6. He died on February 11, 1830 in Sanbornton, Strafford (now Belknap) Co., New Hampshire 5,6. While living in Epping, James served in the American Revolution. He served under various commands as a private in the year years 1777 and 1778. According to one record, he was present at the surrender of General Burgoyne at Saratoga in October of 1777. It is said that after this, James walked some 300 miles to his home, carrying with him his flint-lock musket 31. After his war service, James continued living in Epping, where he married Molly Blake in 1780. In March 1782, James and his wife and child and brother Joseph left Epping and moved to Sanbornton, New Hampshire 5. James and Joseph settled on neighboring farms on land that was deeded to them in part by their grandfather Joseph Wadleigh. (The original owner of this land was Thomas Blake 5 - a distant relative of James' wife Molly. A portion of this land has remained in the family for over two hundred years until it was just recently sold. James was a farmer in Sanbornton and was also a teamster for Lovejoy & Company to Boston 5. He was said by his contemporaries to be a "very exemplary man, training his children religiously" 5. James and his family were Baptists and were faithful members of the First Baptist Church of Sanbornton. They were probably the first of the family to switch to the Baptist faith. According to the DAR and family history, James and his wife are buried in unmarked graves on the old homestead in Sanbornton. There is apparently record though that they were buried in the nearby Franklin Cemetery, in Franklin, New Hampshire. James was married to Molly Blake on June 5, 1780 5 or June 5, 1781 32 in Epping, Rockingham Co., New Hampshire . She was born in 1755 in Epping, Rockingham Co., New Hampshire 5,6. She died on August 14, 1813 in Sanbornton, Strafford (now Belknap) Co., New Hampshire 5. 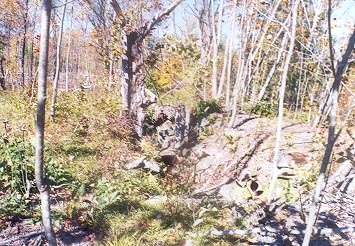 The present (2000) remains of the Wadleigh farmhouse on the Wadleigh homestead in Sanbornton, NH, settled by James Wadleigh in 1782. 1 James Wadleigh was born on December 3, 1781 in Epping, Rockingham Co., New Hampshire 5. He died on August 8, 1835 in Sanbornton, Strafford (now Belknap) Co., New Hampshire 5. He is buried in the Franklin Cemetery, Franklin, Merrimack Co., New Hampshire. He was married to Eunice Farnam on November 25, 1802 in Sanbornton, Strafford (now Belknap) Co., New Hampshire 5. (She was born on February 25, 1782 5 and died on August 15, 1870 in Sanbornton, Belknap Co., New Hampshire 5. She is buried in the Franklin Cemetery, Franklin, Merrimack Co., New Hampshire. 2 Joseph Wadleigh was born on January 11, 1784 in Epping, Rockingham Co., New Hampshire 5. He died on May 1, 1867 in Sanbornton, Belknap Co., New Hampshire 5. He is buried in the First Baptist Church Cemetery, Sanbornton, Belknap Co., New Hampshire. 3 Nancy Wadleigh was born on February 6, 1786 in Sanbornton, Strafford (now Belknap) Co., New Hampshire 5. She died on August 2 5 or 4 1, 1822 in Sanbornton, Strafford (now Belknap) Co., New Hampshire. 4 Polly Wadleigh was born on February 6, 1786 in Sanbornton, Strafford (now Belknap) Co., New Hampshire 5. She died on July 19, 1826 5 or 1827 1 in Sanbornton, Strafford (now Belknap) Co., New Hampshire. 6 Betsey Wadleigh was born on April 30, 1791 in Sanbornton, Strafford (now Belknap) Co., New Hampshire 5. She died on July 1, 1850 in Sanbornton, Strafford (now Belknap) Co., New Hampshire 5. She never married. Her father's will of 1830 left provisions for her for the use of part of her father's dwelling house, as long as she remained unmarried. 7 Sally Wadleigh was born on August 11, 1793 in Sanbornton, Strafford (now Belknap) Co., New Hampshire 5. She died on May 18, 1857 in Sanbornton, Belknap Co., New Hampshire 5. She is buried in the First Baptist Church Cemetery, Sanbornton, Belknap Co., New Hampshire. 8 Asa Wadleigh was born on June 24, 1801 in Sanbornton, Strafford (now Belknap) Co., New Hampshire 5. He died on June 16, 1860 in Sanbornton, Belknap Co., New Hampshire 5. He is buried in the Centre Cemetery, Sanbornton, Belknap Co., New Hampshire. He married second to Jannett Eastman on November 11, 1856 in Sanbornton, Belknap Co., New Hampshire 5. She is buried in the Centre Cemetery, Sanbornton, Belknap Co., New Hampshire. John Wadleigh was born on June 24, 1788 in Sanbornton, Strafford (now Belknap) Co., New Hampshire 1,5,6. He died on August 20, 1850 in Sanbornton, Belknap Co., New Hampshire 1,5,6. He is buried in the First Baptist Church Cemetery, Sanbornton, Belknap Co., New Hampshire. John farmed at various places in Sanbornton until the year 1819, when he took over the portion of his father's homestead that was sold to him by his brother Joseph Wadleigh 5. John appears to have led a rather uneventful life. He followed in his father's footsteps and became a farmer on the same land until his death. John and his wife also had continual membership at the First Baptist Church in Sanbornton. John "inherited" his father's pew in the First Baptist church. At some point in his life, John had some kind of accident where an ax hit him on his knee. This incident made permanently lame for the duration of his life 5. John died of consumption (tuberculosis) 5 in 1850 at the age of 62. His widow Sally died in 1858. Of his 14 grandchildren, only Georgiana Clark, Oscar Wadleigh, Fred Wadleigh, Inez Blake and Sadie Emery had children of their own. John was married to Sally Taylor on March 3, 1814 in Sanbornton, Strafford (now Belknap) Co., New Hampshire 5,6. 1 Molly Blake Wadleigh was born on August 20, 1815 in Sanbornton, Strafford (now Belknap) Co., New Hampshire 5. She died on March 25, 1817 in Sanbornton, Strafford (now Belknap) Co., New Hampshire 5. 2 Mary Blake Wadleigh was born on May 25, 1817 in Sanbornton, Strafford (now Belknap) Co., New Hampshire 5. She died on July 19, 1818 in Sanbornton, Strafford (now Belknap) Co., New Hampshire 5. 3 Jonathan Taylor Wadleigh was born on May 14, 1819 in Sanbornton, Strafford (now Belknap) Co., New Hampshire 5. He died on April 18, 1874 in Sanbornton, Belknap Co., New Hampshire 5. He is buried in the Franklin Cemetery, Franklin, Merrimack Co., New Hampshire. 4 Sarah Ann Wadleigh was born on August 1, 1821 in Sanbornton, Strafford (now Belknap) Co., New Hampshire 5,22. She died on December 13, 1883 in Sanbornton, Belknap Co., New Hampshire 7,22. She is buried in the Franklin Cemetery, Franklin, Merrimack Co., New Hampshire. 5 Eliza Melcher (Wadleigh) Taylor was born on November 2, 1825 in Sanbornton, Strafford (now Belknap) Co., New Hampshire 5,45. She died on June 21, 1916 in Boston, Suffolk Co., Massachusetts 25,45. She is buried in the Harmony Grove Cemetery, Portsmouth, Rockingham Co., New Hampshire. Eliza was named after the wife of her maternal uncle, Daniel Taylor. Sometime between 1825 and 1830, Eliza was sent to go live with the same aunt and uncle Daniel and Eliza Taylor in Boston, Massachusetts. Daniel and Eliza were childless and it appears that Eliza was adopted by them, or at least unofficially assumed their last name. Eliza never married and spent the remainder of her life in Boston, where she had the last name Taylor. 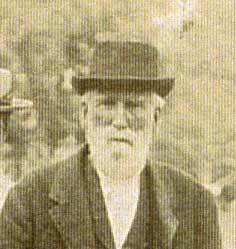 7 Daniel Taylor Wadleigh was born on March 2, 1835 in Sanbornton, Strafford (now Belknap) Co., New Hampshire 5. He died on January 24, 1909 in Andover, Merrimack Co., New Hampshire 8. He is buried in the Franklin Cemetery, Franklin, Merrimack Co., New Hampshire. John Blake Wadleigh was born on April 25, 1829 in Sanbornton, Strafford (now Belknap) Co., New Hampshire 1,5,7,8,38. He died on July 13, 1912 in Sanbornton, Belknap Co., New Hampshire 6,7,8. He is buried in the Franklin Cemetery, Franklin, Merrimack Co., New Hampshire. John was raised in Sanbornton where his family farmed and were faithful members of the First Baptist Church. In 1850, 21-year old John was living at home with his parents where he was working on the farm and listed as having attended school that year. Clearly, he must have already been pursuing some kind of higher education or vocation other than farming. About two years later, at the age of 23, John acquired a daguerrean saloon (basically a traveling photographic studio) and commenced his short career as a traveling photographer. Over the next eight years, he visited many towns in New Hampshire and even went as far as Illinois, where he worked for a year or two 5. By the late 1850s, John ended his career as a photographer and moved back to New Hampshire to engage in other pursuits. In about 1860 he moved to Hill, New Hampshire (near Sanbornton), where he opened a business as a merchant of friction matches 5. Not long after moving to Hill, 31-year old John met and married a young woman named Helen Parker, who lived in town. Their brief, childless marriage was summed up with the statement that Helen "made home happy" 5. Sadly she died in 1862, at the age of 23, not quite 2 years after their marriage. (John must have dearly loved his first wife. After his remarriage, he named his first daughter after her. He also remained close with Helen's parents.) John was undoubtedly heartbroken by the death of his young wife. At about that time, he sold or abandoned his business in Hill and returned to his hometown of Sanbornton, where he probably lived with his brother Daniel on the family farm. John apparently found solace for his grief in the form of a young woman named Abbie Tilton, the daughter of the local Baptist minister. They were married in 1864, by her father, Rev. Jeremiah Tilton, at the First Baptist Church of Sanbornton. John and Abbie farmed on the Wadleigh homestead of Sanbornton and continued to live in his parents' old house, where their first four children were born. 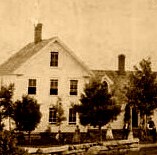 A non-contemporary caption on a photograph of their house indicated that it was abandoned in 1871. More than likely though, the year was 1877 or 1878. At that time, John acquired a new chunk of land a short distance away (called the "Piper Place") and there erected an elegant farmhouse in 1877 5 or 1878 (this house, at 138 Brook Road, is still standing to this day). John and Abbie were faithful members of the First Baptist Church of Sanbornton. A fifth child, Inez, was born to the couple in 1885. In about March of 1912, 83-year old John had a slight injury, but never fully recovered and his health worsened. He died from the effects of the fall at his home in Sanbornton on June 13, 1912, at the age of 83 7. His widow Abbie continued to live in the house until her health worsened so much that in 1928 she moved to Franklin, New Hampshire, to live with their daughter Inez. She died there in 1929. John married first to Helen Mar. Parker on December 27, 1860 in Hill, Merrimack Co., New Hampshire 5. She was born on November 30, 1838 in Hill, Merrimack Co., New Hampshire 5 and died on October 9, 1862 in Hill, Merrimack Co., New Hampshire 5. They had no children. Helen was the daughter of Isaac T. and Mary M. (Fowler) Parker. Her parents retained a close relationship with John after his remarriage. John married second to Abigail Ruthena Tilton on October 9 5,39 or November 9 1,38,40, 1864 in Sanbornton, Belknap Co., New Hampshire. 2 John Parker Wadleigh was born on January 21, 1869 in Sanbornton, Belknap Co., New Hampshire 5,7,8. He died on June 10, 1902 in Laconia, Belknap Co., New Hampshire 7,8. He is buried in the Franklin Cemetery, Franklin, Merrimack Co., New Hampshire. John never married or had any children. He was a tailor by occupation 7 and died of pernicious anemia 7. 3 Fred Tilton Wadleigh was born on November 2, 1870 in Sanbornton, Belknap Co., New Hampshire 5,28. He died on February 13, 1957 in Milford, Hillsborough Co., New Hampshire 9. Fred attended public schools in Sanbornton, New Hampshire and then afterwards attended the New Hampton Institute in New Hampton, New Hampshire, where he graduated valedictorian in 1891 28. He afterwards worked briefly as a school teacher. During the early 1890's, he moved to Milford, New Hampshire, where he worked in the Ober Clothing Company store owned by his uncle John Ober (husband of Harriet Tilton). Eventually (sometime between 1900 and 1910), he took over the business from his aunt and uncle. He apparently became quite wealthy as a result of owning the Ober Clothing Co. Fred also had an interest in politics and was served in the New Hampshire House of Representatives in 1907-1908 and at the New Hampshire Constitutional Convention of 1912, at which he was in support of women's suffrage 28. He later served decades in the New Hampshire legislature up until his death in 1957. 4 Helen Abbie Wadleigh was born on April 26, 1872 in Sanbornton, Belknap Co., New Hampshire 5. She died on May 8, 1955 9, probably in Andover, Merrimack Co., New Hampshire. She is buried in the Franklin Cemetery, Franklin, Merrimack Co., New Hampshire. She was never married or had any children. She was named after her father's first wife. According to family history, Helen had some kind of mental illness. She spent her whole life living with different relatives. She lived with her mother in Sanbornton until about 1928. At that time, she moved to Andover, New Hampshire to live with her cousin Sarah Wadleigh Emery. She spent the remainder of her life in Andover in the house of either Sarah or her son Jay Emery. 5 Inez Hattie Wadleigh was born on September 13, 1885 in Sanbornton, Belknap Co., New Hampshire 10. She died on September 16, 1973 in Franklin, Merrimack Co., New Hampshire 9. She is buried in the Franklin Cemetery, Franklin, Merrimack Co., New Hampshire. Oscar Stearns Wadleigh was born on July 24, 1865 in Sanbornton, Belknap Co., New Hampshire 1,5,6,31. He died on February 1, 1932 in the Bronx, Bronx Co., New York 9,12. He is buried in the US Columbarium, Middle Village, Queens Co., New York. He was named after his maternal uncle Oscar Tilton who died of diphtheria in 1864 at the age of 14. Oscar was raised on the old Wadleigh homestead in Sanbornton, and he and his family attended the First Baptist Church in town. In 1877 or 1878, he moved with his family from their old farmhouse to a new house that his father had built on the other end of Wadleigh Road in Sanbornton. Oscar's parents had hopes that he would receive a "classical education" and apparently attend college 31. Instead, Oscar decided to go on his own route and not attend college. 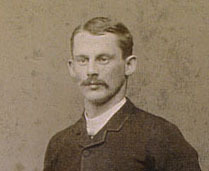 At some point in the 1880s (probably in about 1883 when he turned 18), Oscar left his hometown of Sanbornton and moved to Boston, Massachusetts. He was hired as an "general agent" for a "Boston mercantile house", and apparently worked for them for four years 31. His employment for the Boston company apparently allowed him to travel to many states in America, perhaps as some sort of traveling salesman. Eventually, Oscar focused his attention on the printing industry. At some point in the mid-1880s, Oscar moved to the small town of Franklin, New York, where he "learned trade in transcript" 41. It was probably while living there that he met and began a relationship with a woman named Charlotte Winters, who lived in nearby Cannonsville, New York. Then in 1886, Oscar was living in Cherry Creek, New York, where he was working for the Cherry Creek News, apparently as a typesetter. In late 1886 or early 1887, he then moved to Buffalo, New York. In November 1887, Oscar and Charlotte Winters were married at her parents' home in Cannonsville, New York. Between 1887 and 1892, Oscar and Charlotte lived in Buffalo, where Oscar worked in the printing industry. In 1887 he worked for the Buffalo Times newspaper 41. From 1887 to 1891 he worked for the "C. E. Bunkworth office" 41, which was apparently a book publisher. In the summer of 1892, Oscar and his family moved to Deposit, New York 31, which was close to Charlotte's hometown of Cannonsville. At that time, Oscar purchased one-half interest in the newspaper the Deposit Journal. In 1893, Oscar bought out his partner and became the sole owner of the newspaper. While living in Deposit, Oscar also managed a newspaper called Narrowsburg News 31. In about 1896, Oscar and his family moved to Binghamton, New York. After moving to Binghamton, Oscar was first a foreman of a newspaper composing room (he first worked for the Binghamton Republican which was succeeded by the Evening Herald). Then prior to 1900, he had become foreman of the Herald Publishing Company (a book publisher). In about 1905, he was promoted to superintendent of the same company. Then in about 1908, he began working for the Binghamton Book Manufacturing Company, as its agent to New York City. The company was sold in about 1910 to the Vail-Ballou Press and Oscar continued employment in the same company. Between 1896 and 1907, Oscar and his family rented at least 7 different houses in Binghamton. Then in 1907 they purchased a house at 80 Mary Street in Binghamton. Eventually, work compelled them to move again and in 1912, Oscar and his family sold their house in Binghamton and moved to Brooklyn in New York City. Then in 1914, they moved to the Woodhaven neighborhood in Queens, where they remained. In New York City, Oscar continued working for the Vail-Ballou Press until at least 1915. At about 1915, Oscar left the company to accept a more lucrative offer from a different publisher, J.J. Little & Ives. In 1916, Oscar was treasurer of the Association of Authors and Compilers. In 1919, Oscar left J. J. Little & Ives and began working for the Hoeber Publishing Company, which specialized in medical publications. Sometime between 1920 and 1925 he had left the Hoeber Publishing Company. 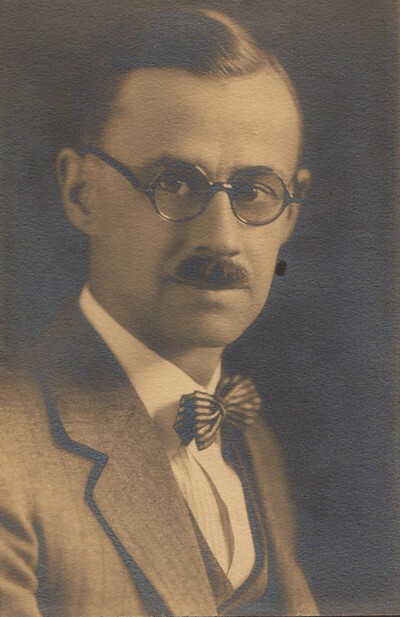 In 1925 he was vice president of the Paul Overhage Incorporation. Then, between 1925 and 1929 he had returned to J. J. Little & Ives, where he worked until his death. He was a superintendent in 1929, but had become a salesman by 1930. His wife Charlotte died in 1924. He died in a hospital in The Bronx in 1932. Towards the end of his life, Oscar apparently had a relationship and marriage with an Italian woman named Lucia or Lucy Michelin. In 1911, Lucy purchased some vacant land in the Morris Park neighborhood of the Bronx. The land remained vacant and she lived elsewhere in the borough. Then in 1915, Lucy sold this land to Oscar Wadleigh. How they came to know each other and why Oscar purchased it is unknown. It is not known how long he owned the property. Oscar and Lucy then began living together and were married in July 1924, five months after Charlotte died. The fact that they had known each other for at least 9 years, their strange land transaction, that his family apparently did not approve of their relationship and that they were married soon after Charlotte died suggests (to me) that they may have been having an affair or some kind of relationship while Charlotte was still living. Oscar lived with Lucy and her sister Victoria in their apartment at 514 Concord Avenue in the Bronx off and on between 1924 and 1932. During that time, he also lived with his son Gerald in Queens. When Oscar died, Lucy was listed as his wife on his death certificate and probate records, but no mention of her was made in any obituaries or information passed down to his descendants. The likelihood is that Oscar's family did not approve of or recognize their relationship and she was effectively forgotten after his death. Oscar appears to have been a family man. Throughout the year 1906, Oscar frequently went to dances and other social events with Charlotte. He also frequently took his son Odin to town where they went bowling at the city club. Like the rest of his family, Oscar was apparently musically inclined. While living in Deposit in the mid-1890s, he was in a cornet band 31. There is also a photo showing Oscar playing the piano. While living in New York City, Oscar was the master for the drill crops of the Knights Templar. Oscar was also a member of the Knights of Pythias 31 and the Masons. Oscar was married to Charlotte Frances Winters on November 17, 1887 in Cannonsville, Delaware Co., New York 9,13,14. 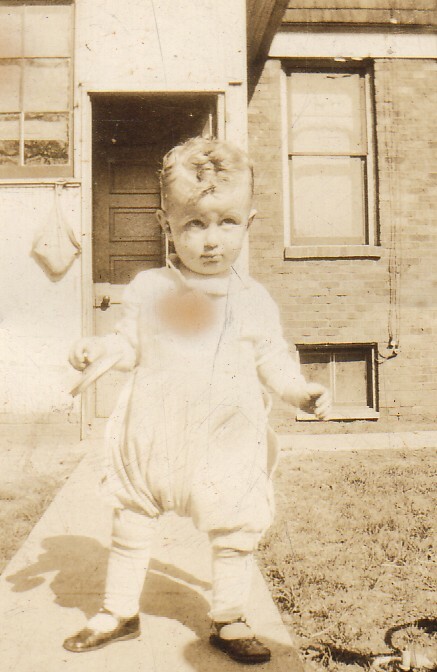 2 Gerald Tilton Wadleigh was born on October 11, 1893 in Deposit, Delaware Co., New York 10,16,17. He died on August 17, 1983 in Osceola Co., Florida 17. Gerald was a printer like his father and remained in New York City. He moved to Kissimmee, Florida sometime in his old age. Oscar married second to Lucia Margarita "Lucy Margaret" Michelin on July 15, 1924, in the Bronx [New York City], Bronx Co., New York. She was born on August 8, 1878 29 or August 30, 1880 30 in Vicenza, Veneto, Italy. She died on July 21, 1957 in Bronx, Bronx Co., New York 29. She is buried in St. Raymond's Cemetery, Bronx, Bronx Co., New York. She usually went by the Anglicized version of her name - Lucy - after moving to America; but her official name remained Lucia. She moved by herself to America in November 1902, at the age of 24. Within the next 5 years, her siblings joined her there. After moving to America, Lucy lived briefly in Pennsylvania before moving to Manhattan, New York City in 1903. Between 1903 and 1910 Lucy lived with her siblings in at least five different apartments in Manhattan. Then in 1910 or 1911, they moved to the Bronx in New York City. Lucy spent much of the rest of her life in the Bronx, where she lived in at least four different apartments. Lucy worked for many years in the garment industry. In 1905 she was described as a "silk spinner". In 1915, 1920 and 1940 she was described as an embroiderer and in 1918 she was described as a designer. In 1918, Lucy declared her intent to become a citizen and she was finally naturalized as a US citizen on June 23, 1922. In 1913, Lucy and her sister Victoria went on a trip to Italy to visit their homeland. Apparently, the family also went on a trip there in the mid-1930s, and may have briefly lived there before returning to New York City by the late 1930s. The circumstances of Lucy's relationship with Oscar Wadleigh are not known. In 1911, Lucy and her sister purchased a vacant lot along Stillwell Avenue in the Bronx. Then in 1912, Victoria deeded her portion of the property to her sister. Then in 1915, Lucy sold this vacant lot to Oscar Wadleigh. How they came to know each other and why either of them purchased this property is unknown. They must have had some sort of relationship after this date though. Oscar's wife Charlotte died in February 1924 and they began living together soon after. They were married in July 1924. Between 1924 and his death in 1932, Oscar lived at different times with Lucy in her apartment in the Bronx and also with his son Gerald in Queens. Surviving records also infer that Oscar's family did not approve of his relationship or marriage with Lucy. When he died, there was no mention of her in his obituaries and no mention of her was made in information passed down to descendants. When he was enumerated in his son's household, he was listed as a widower. After Oscar's death, Lucy continued to live in the Bronx with her siblings. In 1941, her sister Victoria died. Then in July 1957, Lucy died at the age of 78 of natural causes at the St. Francis Hospital in the Bronx. Less than a month after her death, her brother Antonio applied for a passport and moved back to Italy, where he lived with his surviving sister Rosina and her family. He died there the following year. Odin Francis Wadleigh was born on August 19, 1888 in Cannonsville, Delaware County, New York 6,10,13. He died on August 5, 1964 in Indianapolis, Marion Co., Indiana 19. He is buried in the Crown Hill Cemetery, Indianapolis, Marion Co., Indiana. Odin was probably named after his great uncle Josiah Odin Tilton. Odin was born in Cannonsville, probably at his maternal grandparents' house in the center of the village. Sadly, the quaint village of his birth no longer exists and the physical location can be found at the bottom of the Cannonsville Reservoir. Although he was born in Cannonsville, he probably never lived there. Odin lived with his parents in Buffalo, New York until 1892. On several occasions, Odin traveled with his mother back to Cannonsville to visit his grandparents. They also traveled to Sanbornton, New Hampshire to visit with his paternal grandparents. In the summer of 1892, Odin and his parents moved to the city of Deposit, a short distance away from Cannonsville. Once again, they did not remain there long, probably only one or two years. In about 1896, Odin and his family moved to Binghamton, New York. There, Odin spent the remainder of his childhood and his public school education. Odin graduated from the Binghamton High School in 1906. Odin's complete diary from the year 1906 has been transcribed and is now online. After graduating from high school in 1906, Odin acquired his first job at General Electric Company in Schenectady, New York. It is unknown exactly how long he worked for General Electric, but apparently in at least 1906 and 1907. Even in high school, Odin had plans to attend college for electrical engineering (he had hoped to attend Cornell University or Syracuse University). In about 1908, he began attending the Pratt Institute in Brooklyn, New York City. There, he was a student of electrical engineering and graduated in 1910. At some point, Odin also worked as an engineer for the Third Avenue Railway in New York City. While working in New York, he apparently lived both in Brooklyn and in Newark, New Jersey. During this time, he began searching for a new job and because he did not feel wedded to New York, sent out applications around the country. At the same time, he and his girlfriend Eva Marsh of at least six years were married in 1912. The company that eventually hired him was Sanborn Electric in Indianapolis, Indiana. Odin and Eva moved to Indianapolis in 1912 where they rented rented several different houses in Indianapolis. In 1922 or 1923, the family moved to 3030 N Delaware Street in Indianapolis, where they lived for about 20 years. Odin continued with steady employment at the Sanborn Electric Company. In 1920, he was promoted from engineer to secretary. Yet while his career was taking a turn for the better, tragedy struck his family. In 1921, his beloved wife Eva committed suicide. It is thought that this may have been a result of postpartum depression developed after she gave birth to her son Gerald seven months earlier. Odin was heartbroken and traumatized by his wife's death and afterwards burned or destroyed anything that would remind him of her, including priceless photographs. After his wife's death, Louise Custer (a close friend of his wife and also a co-worker at Sanborn Electric) was helpful to him and his family and they eventually became engaged. They were married in 1923 and spent their honeymoon in New York. Odin's hard work at his job eventually paid off in 1941 when he was named President of Sanborn Electric Company. He continued working as president until 1960, when at the age of 72 he resigned but remained Chairman of the Board until his death. In about 1943, Odin and Louise purchased a spacious home at 4220 Roland Road in the Wynnedale neighborhood of Indianapolis. Odin and his family were noteworthy Indianapolis citizens and were involved in a number of civic organizations. In later years, Odin and his family were members of the Church of Christ, Scientist, but when they first moved to Indiana in 1912 and through the 1920s, were members of the Universalist Church. Odin's later years must have been difficult as he had to deal with his wife's lengthy battle with cancer until her death in 1962. Odin died from heart failure in 1964 at the Methodist Hospital in Indianapolis. Odin was married first to Evangeline "Eva" Marsh on May 28, 1912 in Binghamton, Broome Co., New York. She was born on February 3, 1889 in Binghamton, Broome Co., New York. She died on February 21, 1921 in Indianapolis, Marion Co., Indiana. She is buried in the Floral Park Cemetery, Johnson City, Broome Co., New York. Eva was the daughter of Andrew Julian Marsh and Sarah Amelia Burt of Binghamton, New York. 1 Eric Julian Wadleigh was born on July 12, 1916 in Indianapolis, Marion Co., Indiana. He died on September 1, 2011. 2 Gerald Marsh Wadleigh was born on July 16, 1920 in Indianapolis, Marion Co., Indiana 6. He died on August 10, 1984 in Indianapolis, Marion Co., Indiana 9. He is buried in the Crown Hill Cemetery, Indianapolis, Marion Co., Indiana. He was married to Charleen Dabbs. Gerald Marsh Wadleigh was born July 16, 1920 in Indianapolis, IN. He was the second son of Odin Francis and Evangeline Marsh Wadleigh. His mother, suffering from post-partum depression, committed suicide on February 21, 1921. Odin married Louise Custer, a family friend, in 1923, and their son Paul Custer Wadleigh (1925-2007), was Geraldï¿½s half-brother. William and Bea Devine, church friends of Louise and affectionately known as ï¿½Aunt Bea and Uncle Willï¿½, looked after Gerald and his older brother Eric after Eva died, and subsequently helped Odin and Louise with the three boys and the household at 3030 North Delaware in Indianapolis. Louise (known to her grandchildren as Dudu (a nephew's mispronunciation of Lulu, short for Louise) had been a family friend of Odin and Eva. Louise was instrumental in ensuring that Evaï¿½s surviving brother, Robert Pawnee Marsh of Cincinnati, was included in family gatherings and that her step-sons got to know their maternal uncle. Gerald attended Shortridge High School in Indianapolis, and was a member of Boy Scout Troop 82, attaining the rank of Eagle Scout. After graduating high school in 1937, he attended Purdue University before enlisting in the Army. On June 24, 1944 he married Charleen Dabbs, who graduated from Shortridge shortly after Gerald but met him through mutual friends while he was attending Purdue. They married in Tabernacle Presbyterian Church in Indianapolis, where Gerald later served as deacon, elder and chairman of the Board of Trustees. Gerald served in England and Germany as a Lieutenant in the Army Signal Corps. After his discharge in 1946, he returned to Indianapolis and went to work for The Sanborn Electric Company, a commercial electrical construction firm of which his father Odin was President. In 1961, he was named President of Sanborn Electric Company and served in that capacity until 1981, when he was named Chairman of the Board. Although he did not graduate from college, he was the president and governor of the North Central Indiana Chapter of the National Electrical Contractorï¿½s Association, and a member of NECAï¿½s Academy of Electrical Contractors. In 1975 he was named Electric League Man of the Year, and in 1976 received the NECA McGraw Medal in recognition of his national contributions to the commercial electrical contracting industry. He was a driving force in establishing Purdue Universityï¿½s College of Construction Technology. Gerald was the president of the YMCA of Greater Indianapolis from 1971-1973, and was Chairman of its Board of Trustees from 1975-1982. His personal interests included railroads, Greentown glass, and forestry. And he was, forever, a Purdue fan and member of the John Purdue Club. During the early 1980ï¿½s, it became apparent that something was wrong with Gerald. His mobility wasnï¿½t the same; his speech slurred; he had trouble using his hands, swallowing became difficult. After a series of tests which ruled out any other cause, he was diagnosed in May, 1984 with Amyotrophic Lateral Sclerosis (ALS, or Lou Gehrigï¿½s disease). He died at his home, 122 West 81st Street, in Indianapolis, on August 10, 1984. He is buried in Crown Hill Cemetery in Indianapolis. 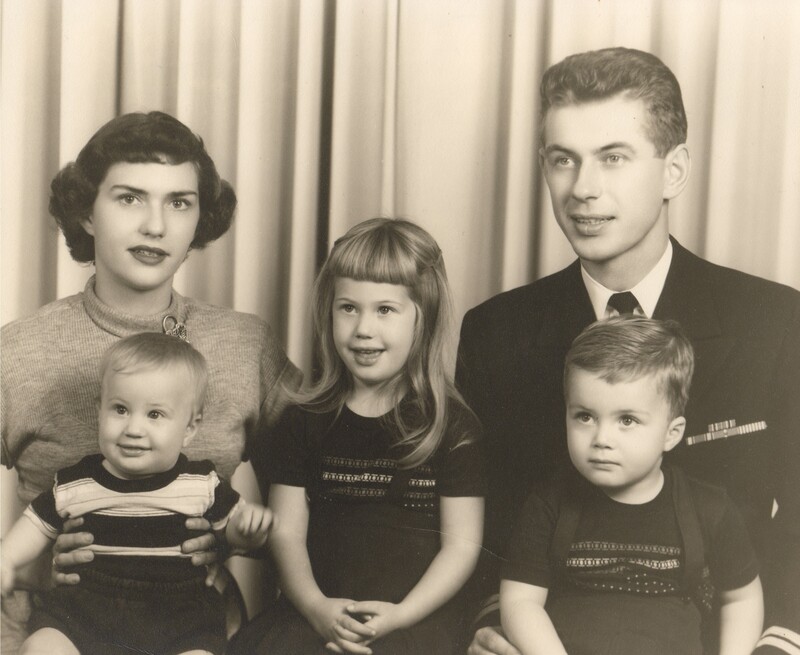 Gerald and Charleen had 3 children: Susan, Robert Marsh and William Odin. Susan Wadleigh Gard at swgard@hotmail.com is a researcher/descendant of this line. (She is Gerald's daughter). Odin was married second to Louise Elizabeth Custer on September 1, 1923 in Indianapolis, Marion Co., Indiana 20. 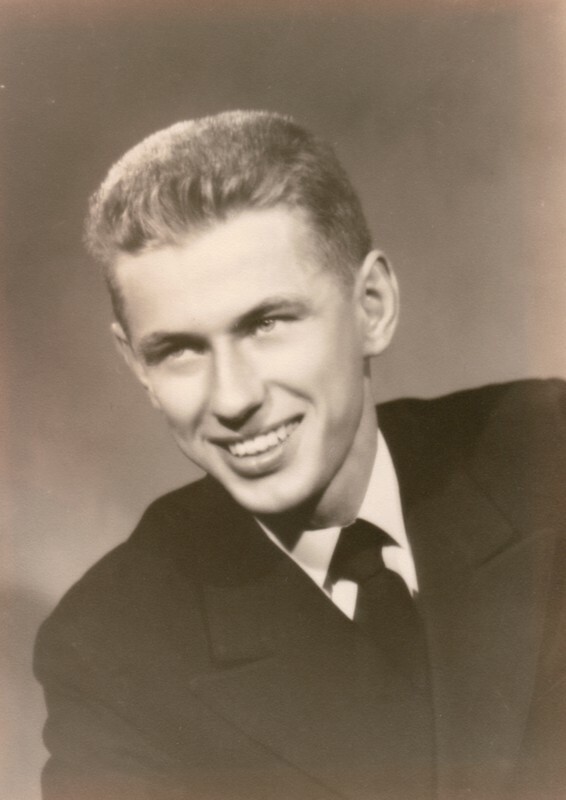 1 John Odin Wadleigh was born on August 19, 1924 in Indianapolis, Marion Co., Indiana 22. He died on August 23, 1924 in Indianapolis, Marion Co., Indiana 22. He is buried in the Crown Hill Cemetery, Indianapolis, Marion Co., Indiana. John suffered from "heart trouble" and died at the age of 4 days. He does not have a tombstone in the Crown Hill Cemetery. Paul Custer Wadleigh was born on December 6, 1925 in Indianapolis, Marion Co., Indiana. He died on April 8, 2007 in Pullman, Whitman Co., Washington. Paul was raised in Indianapolis, Indiana, where he first lived with his family at 3030 N Delaware Street. In about 1943, he moved with his family to their Wynnedale house in Indianapolis at 4220 N Roland Road. Paul graduated from Shortridge High School in Indianapolis in 1943. Afterwards, he attended Purdue University Officer Training School for the United States Navy. He served in the Pacific Theater as a mine sweeper during World War II. He afterwards served in the Korean War before he was discharged in 1954 as a lieutenant. In 1946, Paul was married to Bettye "Moe" Brown, whom he had known since junior high school. They had three children together; Karen, Mark and Randy. Because of different teaching positions and military requirements, they had to move quite a bit. After their marriage, they moved to Bloomington, Indiana, where Paul attended graduate school at Indiana University. Sometime between 1950 and 1952, they moved to Indianapolis, Indiana. In August 1952, they moved to Long Beach, California. (In California, they also lived briefly at San Pedro and at Mare Island Shipping Yards.) In March 1954, they moved back to Indianapolis, where they lived at 4805 Carrollton Avenue. In June 1958, they moved again to Bloomington, Indiana, where they lived at 135 N Bryan Street. Paul would have had a lucrative career ahead of him had he stuck with the family business, Sanborn Electric Company. Instead, he decided to follow his interests and pursued a career in teaching. After his military service was over, Paul attended Indiana University in Bloomington where he received both his Master's and his PhD. Meanwhile, Paul made his living by teaching English, drama, speech, theater and history at local schools. (He was teaching at Arsenal Technical High School in Indianapolis in 1956; and he is also said to have taught at Shortridge High School.) In 1957, he began teaching theater arts at Indiana University. In 1961, he moved his family to Bellingham, Washington, where he taught theater at Western Washington University. They lived there until 1965, when they moved to Pullman, Washington, where he had a teaching position at Washington State University. He was a professor at this college until his retirement in 2004, ending a 54-year career of teaching students. At WSU, he created and directed many theater and teaching programs. These include the 'Summer Palace,' a re-creation of the 19th century American touring theater experience in 'typical' small American towns, and 'The Commedians', a group of university Shakespearean actors which toured high schools for several decades throughout Washington, Oregon, Idaho, and Montana. In old age, Paul decided to try his luck in Hollywood. In 1999, just 8 days after arriving in Los Angeles, he got a role in a four hour Revolutionary War pilot movie called "Dawn of our Nation." Paul then had the lead role in the 1999 independent film Sammyville. (An online review of the movie said "The old man who plays Sammy is the best.") In 2000, Paul also had the role of "old man" in the independent film Dog Story. Paul and Moe were divorced briefly in the mid-1950s and remarried in June 1958. In June 1971, they divorced again. Paul then married Camille Hutchinson in 1972 and they had two children together; Rafe and Gillian. They moved to the nearby town of Palouse, Washington, where Paul lived for the remainder of his life. Paul married first Bettye "Moe" Boone Brown on December 22, 1946 in Indianapolis, Marion Co., Indiana. They divorced in February 1971. Paul married second Camille Claudette Hutchinson on May 31, 1972 in Pullman, Whitman Co., Washington. He married Barbara Ann Plymale. Ryan is the webmaster for this website - contact me at ryanwadleigh@yahoo.com. 1. Wadleigh, Donald E. The Wadleigh Chronicle. (Heritage Books Inc., Bowei, MD, 1992). 2. Noyle, Libby and Davis. Genealogical Dictionary of Maine and New Hampshire. Southworth Anthoensen Press, 1928-1939. 3. Savage, James A. A Genealogical Dictionary of the First Settlers of New England. Boston, MA: 1860-1862. 4. Dow, Joseph. History of the town of Hampton, New Hampshire. L.E. Dow, 1893. 5. Runnels, Rev. M.T. History of Sanbornton, New Hampshire. Alfred Mudge & Son, Boston, MA, 1881. 22. Perley, M.V.B. History and Genealogy of the Perley Family. M.V.B. Perley, Salem, 1906. 23. History of the town of Mont Vernon, New Hampshire. Blanchford Printing Co., Boston, 1907. 24. Conant, Frederick O. A history and genealogy of the Conant family in America. Privately printed, Portland, ME, 1887. 25. 1917 Directory of Boston, MA. 28. Abbott, Frances M. One Thousand New Hampshire Notables. Rumford Printing Co., Concord, NH, 1919. 31. The Leading Citizens of Broome County, New York. Biographical Book Review Publishing Co., Boston, 1894. 33. Pope, Charles H. The Pioneers of Maine and Hew Hampshire, 1623-1660. Boston, 1908. 38. Locke, Arthur H. A History and Genealogy of Captain John Locke (1627-1696).... The Rumsford Press, Concord, NH, 1916. 41. The Typographical Journal, Vol. X, No. 1, Indianapolis, 1897. 42. Brown, Warren. History of Hampton Falls, Volume II... The Rumsford Press, Concord, NH, 1918. 43. Brown, Warren. History of the Town of Hampton Falls, New Hampshire... John B. Clarke Co., Manchester, NH, 1900. 44. Tombstone inscriptions, Upper Yard Burial Ground, Kensington, New Hampshire. 45. Tombstone inscriptions, Harmony Grove Cemetery, Portsmouth, New Hampshire.